In 1943, as the Second World War rages on, India is fighting a combat of her own: independence from British rule. Subash Chandra Bose, founder of the Indian National Army, has become disenchanted with Mahatma Gandhi's Ahimsa (non-violent) movement and desires to fight fire with fire. Recognizing the growing dominance of Imperial Japanese Army in the Indo-China region, the INA allies itself with the Japanese, hoping to ride the wave to Delhi. Indian troops in the British Indian Army are locked in pitched battles with both the INA and its Japanese contingent. 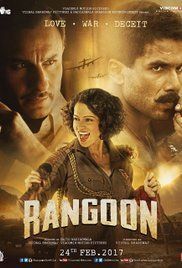 In one such skirmish close to the Indo-Burma border, Jemadar Nawab Malik (Shahid Kapoor) and a group of fellow soldiers are cornered by the Japanese infantry. Running to escape on a barge, he is shot and captured as a prisoner of war. Meanwhile, the INA's top brass desperately seeks finances to replenish its heavy ammunition to aid the charge to Delhi. Read more on Wikipedia.